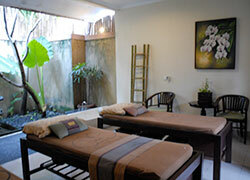 Bali Spa It is located near the popular sightseeing spots and 30 minutes away from the airport. 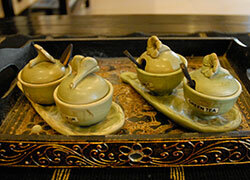 Bali Orchid Spa uses 100% natural essences for aroma oil and scrub. You will be truly relaxed by their faithful treatments and services. This 3 hours treatment included body esthe and italian meal at restaurant Kumangi. It is special time just for you. ※Free transport from hotel to spa and Kumangi restaurant. Please take own transport after meal. 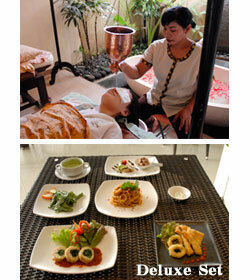 This special menu include Shirodara, Balinese Massage, Body scrub & Italian meal. You will be satisfied by 3 hours relaxation massage and tasty meal! *Free transport from hotel to spa and Kumangi restaurant. 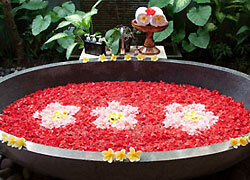 After traditional Balinese massage, they will treat your skins and body by Lulur, a traditional Indonesian body scrub. Yogurt Moisture to tighten up your skins and Flower Bath are also included. This is a new package HIROCHAN and Bali Orchid Spa created together including traditional Balinese massage which gives you a great relaxation and Yogurt moisture to make your skins softer. You can have the meal either before or after the treatment. Please let us know your choice when you make a reservation. Recommended for Sunburned Skin! Let’s cool it down with Aloe Essence. NEW MENU♪ You can experience lymphatic Massage to help detoxifying and Shirodara. The popular HIROCHAN original package! Your burned skin will be refreshed by aloe vera to cool down and honey to moisten. This reasonable priced package even includes Shirodara! Using pure Indonesian cacao to adjust and moist skin. It works for anti aging and whitening. You will enjoy the treatment with rich chocolate smell. Package for Treat a Whole Body! Spend a romantic moment with your beloved by taking this wonderful treatment. The package includes candles, roses and heart-shaped cake. After relaxation foot bath, whole body massage using by your favorite oil. The massage works for improve a flow of the limph. Reflexology is shiatsu technique massage that stimulates all the points on sole of foot to straighten a balance of the organization and the organ of the whole body. They massage a part of the body which a flow of the lymph isn’t smooth, so it gets improve. You might feel the massage is little strong, but it effects on restoration of youth. After the treatment you will feel amazingly refreshed! By using warmed stone, they massage whole body. Mysterious power the stone have ease stiffness of the muscles and improves blood circulation. 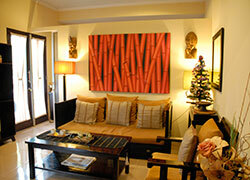 You will be able to feel nervousness of the body is getting out from your body. 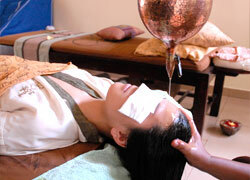 Shirodara is a traditional Indian treatment to create relaxation and serenity. It begins with a soothing foot and neck and head massage to become calm emotionally. Then, warm medical oil will be poured on your forehead to stimulate a point called “The Third Eye”. Shirodara ease a headache, insomnia, anxiety, and stress. It starts with cleansing pores in the skin. This luxuriant facial massage removes ageing toxins from the facial tissues. Face Mask nourishes the epidermis to revitalize the facial skin. Moisturizer will firm and protect the skin from the harsh tropical environment. After shampoo, they remove all the stains on pores in the scalp to improve blood circulation of the scalp. Massaging head, neck and back relaxes an upper body. Your hair will be smooth after the treatment finishing with conditioner. The warm flowered water hand/foot bath cleans and softens your nails. Enjoy a full hand/foot massage to smoothen and relax your hand/foot. You can choose favorite nail arts for your nails to finish this course. Let’s make a great memory of the trip in Bali!!! You can be like Balinese wearing a traditional Balinese costume and make-ups. It will be a great memory and a souvenir. ☆ Need to start this menu by at 17:00 due to outside photo session. Available Free Transportation: Kuta, Seminyak, Sanur, Jimbaran and Nusa Dua areas. Need extra charge to other areas. Please ask more info. Children can wait in the lobby or the treatment room. There are menus for children over age 7. I was worried about my back tension, and I had Balinese massage. Massage with relaxed strength that increase both lymph circulation in body and the natural healing power. I was nervous at first, and I never thought that I’d fall asleep. I felt so good.